An Associate Degree is an academic degree awarded by community colleges, junior colleges and some bachelor’s degree-granting colleges and universities upon completion of a course of study usually lasting two years. Common abbreviations are AA (Associate of Arts), AS (Associate of Science), AAS (Associate of Applied Science; or in some cases, Associate of Arts and Sciences), AOS (Associate of Occupational Studies), and ABA (Associate of Business Administration). In the United States and Canada only, an associate degree is equivalent to the first two years of a four-year college or university. It is the lowest kind of academic degrees offered at university. It is also equivalent to the UK’s foundation degree. In 2000, Hong Kong introduced associate degrees, as an equivalence to higher diplomas. These programmes are mainly provided through affiliated colleges at universities. Advantages include shorter duration than a bachelor degree, more evening classes for those with day jobs, and often a more convenient location. In the USA and Canada, many students first attend a local community college before transferring to four-year college in order to save money. These courses take approximately 2 years to complete, and are worth roughly 1-2 years of a Bachelor Degree. “Diploma” and “Advanced Diploma” are titles given more practical courses, while “Associate Degree” is given to more academic courses. Being the first formal degree level available from university, you will need to have completed a high school level of 12 years in most countries, need to prove you can speak the language of instruction (usually English language for international programs), and be able to get funding/scholarships to pay for your studies, accommodation, food and other costs. You must be able to get a passport and visa if the study is in another country. 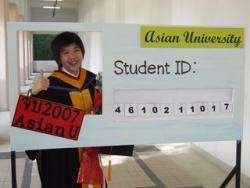 To get the visa you will need to prove you have adequate funding for university and living fees. As, Myanmar high school education, or Tenth Standard is only 10 years long, this means many universities will not accept you without an additional two years of university, making a total of 12 years of education. If you do not meet the 12 years requirement, then you should consider taking an equivalence exam such as the GED or IGCSE or the SAT which may be accepted in place of the 12 years of education. You can increase your chances of getting accepted by having as many qualifications, exams, and related experiences as possible. This means that you could take an English language exam such as TOEFL or IELTS, a high school equivalence exam such as the GED, SAT, or IGCSE, and you can volunteer or work in an organization related to what you are planning to do in the future. Read through the qualifying exams section to find specific information about available exams and how to study for them. Associate degrees are usually priced the same as bachelor degrees per year as they are the first half of a bachelor degree. In general, bachelor degrees are less expensive than master or PhD degrees. Associate degrees remain unpopular in Asia because scholarship organizations do not usually fund study of an associate degree. In Asia, students usually prefer to start university with a bachelor degree, as they have a much better chance of getting a scholarship. In the USA and Canada, associate degrees are popular because they are cheaper and more convenient than a bachelor degree and students can pay for the tuition by working at a part time job. Many associate degree graduates use the degree to get education in a specific area and then go off to work. Having a degree is often more respected than having a diploma. Many people may later try to continue studying beyond an associate degree to obtain a bachelor degree.